One hundred ten years ago today (18 January 1908) the first Week of Prayer for Christian Unity was observed. Founded as the Church Unity Octave by the Rev. Paul Wattson, and initially observed only by the Friars and Sisters of the Atonement, the week was dedicated to prayer for the unity of a divided Christianity. But just eight years later, in 1916, Pope Benedict XV extended the observance of the Week of Prayer to the entire Catholic Church. Half a century later, with the Second Vatican Council, the Catholic Church committed itself fully to the ecumenical movement, the work of restoring unity between Christians. In writing about this year’s observance of the Week of Prayer, I would like to reflect on some of results it has accomplished. Happily, these correspond to the work and mission of CNEWA, of which Father Paul was a co-founder. Father Paul was always fascinated by the Churches of the East — both Catholic and Orthodox. After World War I Christians in the Middle East suffered greatly. In addition to the expected results of war — such as loss of life, destruction of property, famine and being driven from one’s home — something new was happening. In the lands which had been part of the defeated Ottoman Empire, Christians — Armenians, Assyrians and others — were targeted for extermination. In a perverse way, the persecution of Christians was “ecumenical.” It made no difference if one were Orthodox or Catholic, all Christians were slated for extermination. The persecutors ironically grasped the unity between Christians better than did the Christians themselves. In this situation, Father Paul saw CNEWA as a way to help Christians in the Middle East survive. It came at a moment of great division. In the early 20th century, relations between the Catholic and Orthodox churches were far from good. At the time of the first observance of the Week of Prayer, Orthodox and Catholic Churches in the Middle East — separated since 1054 by mutual excommunications — barely communicated and deeply distrusted each other. But from that period of hostility and division, what has been achieved in the last 110 years through prayer and dialogue is truly remarkable — and, even, inspiring. One of the most amazing changes since 1908 has been in relations between the Catholic and Orthodox churches. On an institutional level, Vatican II set the Catholic Church on a path of dialogue with the Orthodox churches. The encounter between Pope Paul VI and Patriarch Athenagoras in the Holy Land on 6 January 1964 began a tradition of genuine friendship between the Bishop of Rome and the Patriarch of Constantinople. A year after the encounter in the Holy Land, on 7 December 1965, Pope Paul VI in Rome and Patriarch Athenagoras in Constantinople solemnly proclaimed that the mutual excommunications of 1054 were rescinded. This work has born abundant good fruit. The Holy See and the Phanar (the seat of the Patriarch of Constantinople) exchange high level visits twice a year. Catholic and Orthodox theologians work together and meet regularly, attempting to overcome theological differences between the two churches. Pope Francis and Patriarch Bartholomew, who can be described as friends, have worked together on issues such as Christian responsibility for the planet. The pope’s encyclical Laudato Si’ on the environment was written with input from Orthodox theologians and both the pope and patriarch have spoken in unison about the importance of the issue. In the Middle East, where CNEWA works, the situation for Christians has become dire. Both Catholic and Orthodox Christians face the real possibility of extinction in the lands where Christianity was born. Pope Francis speaks of “the ecumenism of blood” in which Christians find themselves thrown together, persecuted not because they are Orthodox or Catholic, but because they are all Christians. The experience in the Middle East has led the churches to a deep realization that what they have in common is far deeper than that which divides them. As we begin the 110th observance of the Week of Prayer for Christian Unity, the challenges facing us are admittedly daunting. However, by reflecting on how things have changed since 1908 between Catholics and Orthodox (as well as Catholics and Protestants), we are filled with encouragement and hope. There are signs that this annual Week of Prayer really has made a difference among those who call ourselves followers of Jesus Christ. “This is the only aspiration of those who authentically profess themselves to be believers and who never tire of imploring with prayer a future of brotherhood for all,” Pope Francis wrote in the letter to Sheik Ahmad el-Tayeb, the grand imam. El-Tayeb hosted a meeting 17 January with Christian and Muslim clerics and regional political leaders in reaction to U.S. President Donald Trump’s decision in December to recognize Jerusalem as the capital of Israel and to begin preparations to move the U.S. embassy there from Tel Aviv. “In particular, I raise heartfelt prayers that leaders of nations and civil and religious authorities everywhere would work to prevent new spirals of tension and support every effort to make agreement, justice and security prevail for the populations of that blessed land that is so close to my heart,” the pope said in the letter, which was published 18 January by the Vatican. Bishop Oscar Cantu of Las Cruces, New Mexico, chats with an elderly Palestinian woman on 17 January in the Beit Emmaus Home for the elderly and disabled in Qubeibeh, West Bank. 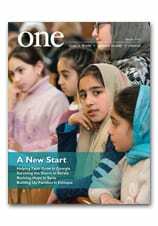 Editor’s note: Today we begin a periodic series, “Stories from the Field,” first-person accounts of the impact CNEWA’s work is having around the world. Today we hear from Sister Nigisti Desta, who grew up in a CNEWA-supported orphanage in Ethiopia. Our regional director in Addis Ababa, Argaw Fantu, spoke with her recently and she shared with him this moving account of her life. I was born in Mekele town, in northern Ethiopia’s Tigray region, in 1984. My mother is Aregash Kahesay. I was the third child born in my family, with four brothers. My father died when I was an infant, so I didn’t know him. Raising five children with no father was the biggest burden for my mother. Thus my mother sent my oldest brother and me to boarding school. My brother went to the boys’ boarding school in Dessie run by the Capuchin Brothers, while I went to the Kobo Orphanage run by Ursuline Sisters. From grades 1-4, I attended Blessed Gebremichael Catholic School in Mekele. From 1996 to 2002, being at the orphanage with the sisters, I attended grades 5-12 in Kobo. While at the orphanage, I took not only academic classes, but also religious classes from the sisters. These became the cornerstones of my life. I learned how to do household chores and how to live in a community. What the sisters were doing for us — motherly care, showing love, fulfilling our needs — was very touching. I remember all these things. Sometimes, donations would arrive, and the sisters would use the money to buy shoes and clothes for us. They told us that there are supporters behind the scenes, especially CNEWA. Over time I had a lot of positive observations on the services delivered by the sisters and the generosity of their hearts. I started pondering in my mind, thinking that “if the sisters dedicate their life and time to serve us orphaned and semi-orphaned children like this, why not me!? Why couldn’t I serve others in the future and be one of the sisters?” This thought grew within me. After completing my secondary education, I discerned my vocation and joined the same congregation. When I asked the sisters to join their congregation, they accepted me immediately. In 2003, they sent me to Addis Ababa to begin my postulancy studies. I did my postulancy for two years and then spent two years in the novitiate. In 2006, I made my first vows and then was sent to Wolisso St. Luke Hospital and Nursing College to pursue my studies in nursing. I did that for three years. Upon graduating from Nursing College, I was assigned to serve in the clinic of Ursuline Sisters in Addis Ababa at a place called Gurd Shola. I served in this clinic for three years, from 2009 to 2012. While serving at the clinic, I got the opportunity to attend Health Officer Courses at Rift Valley College for four years and I earned my degree. Going forward, currently I am doing my second year medical studies at Hayat Medical College in Addis Ababa. It is a six-year course and, God willing, I will graduate in 2022. With God’s will and guidance, together with the support of generous donors like CNEWA and the maternal care and love of the Ursuline sisters, upon completing my medical studies I would like to serve my congregation — and, in particular, the people of Kobo in the neighborhood where I grew up. I know there are some girls who didn’t get the kinds of opportunities I have now. They need moral support and, if possible, material assistance to make their dreams real. I am so grateful to CNEWA and its donors. Without their support, my life today as a religious sister working in health care would not have been possible. For all your good deeds, may the good Lord reward you! I confidently say that I am the product of CNEWA’s support. Thank you so much. May God bless all of you. I keep you in my prayers. In 1844, seven Daughters of Charity of St. Vincent de Paul sailed from France to Alexandria at the request of Egypt’s ruler, Muhammad Ali. They were well received and given a house in Alexandria. From there, they opened a dispensary, where they started their service. It was not common at this time in Egypt to see sisters outside of convents, serving the community. The locals called the dispensary Saba Banat (“Seven Daughters”). As the charity work grew, the street itself came to be known by that same name. St. Vincent de Paul founded the Daughters of Charity in France in 1633 with the help of St. Louise de Marillac. Until that point, religious vocations among women often took the form of a contemplative life in relative seclusion; the founders of the Daughters of Charity, by contrast, encouraged the sisters to work outside their convent — to serve Christ in the persons of those poor or in need, through material and spiritual works of mercy. Today, the congregation has a presence in 93 countries around the world. The first seven Daughters of Charity in Egypt in Alexandria were doctors and nurses, including specialists in ophthalmology. When the French Suez Canal Company was digging the canal in the middle of the 19th century, the sisters went to work in nearby hospitals to care for workers. After the completion of the canal, they continued to work in governmental hospitals in Port Said, Ismailia and many other facilities in Egypt. Currently, three sisters still work in one of the governmental hospitals in Port Said, maintaining the old tradition. Over time, the Alexandria sisters gradually expanded their services, even opening schools in the early 20th century. Their presence peaked in 1952, the same year that witnessed a revolution that overthrew the monarchy and the establishment of a republic. In 1959, the government seized the Saba Banat dispensary as part of a wider campaign of nationalization. In 1963, the dispensary was reopened in a building attached to the school in the At Attarin neighborhood. It kept its old name, despite moving from the old street. Nowadays, the Daughters of Charity have nine convents in Egypt, where some 50 sisters live and serve locals by running dispensaries, schools, food kitchens and programs teaching literacy and handicrafts to young girls in Upper Egypt.